I did it ! Funky Junk Interiors (Donna) is my inspiration. 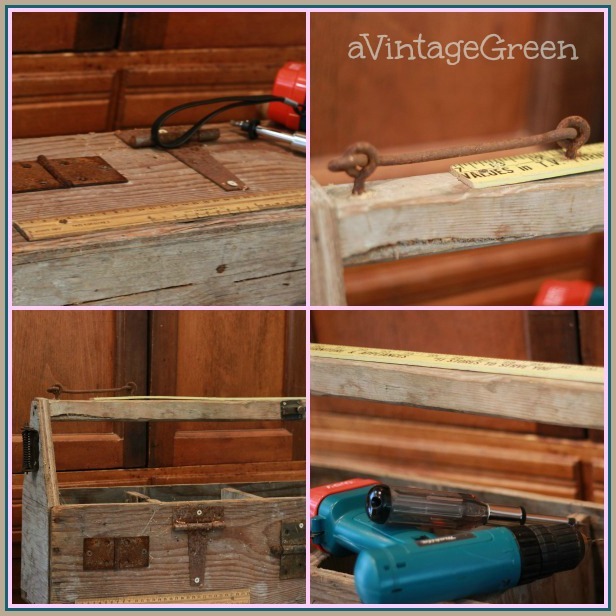 Drill, screwdriver, drill bits, old screws, rusty hook/eye and hinges, two old rulers and - I have a funky junk tool box. Here is the before - just as it was found at a garage sale. Unearthed some rusty hinges and a big hook/eye from my shed. Rulers are from earlier garage sale finds. Used my small drill (my Christmas present from years ago), and two sizes of drill bits so I wouldn't split the old plywood. Hand screwed the screws (that sounds funny). Garden art - handy as well. I LOVE this and LOVE Funky Junk Interiors!!! I can't wait until we have a house with a yard so I can have a garden! This is really cool! I wish I had one for my yard! Joy - that is the cutest thing I have ever seen!! Love the old rusty pieces you put on. Darling!! Cool embellishments on the tote! Cute! what a great idea. it will be a great backdrop for colorful flowers, etc. You've made a great job of upscaling it to a vintage treasure with all the bells and whistles!! You did a great job, Joy! It's such a great feeling when we can put something together like this and see a wonderful end result. This is great...love it! Great job! 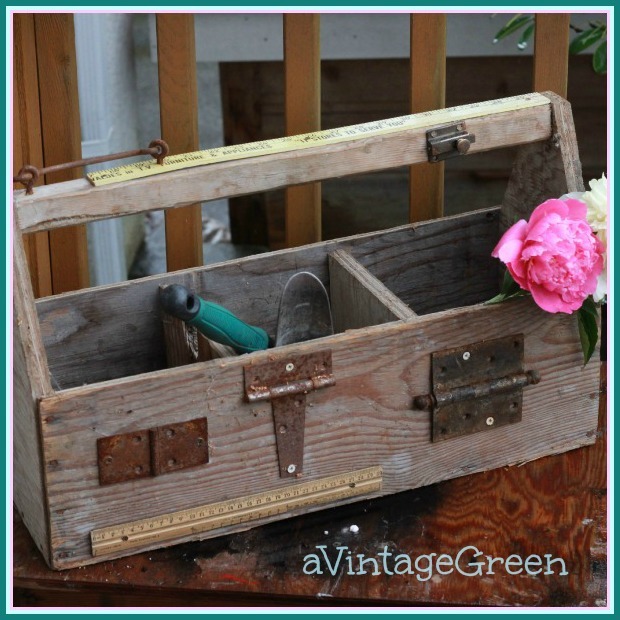 LOVE this---great overhaul piece. I adore the rusty hinges and latch. It's funny but it speaks my language. I love your new toolbox! Believe me when I say I am crazy about toolboxes. 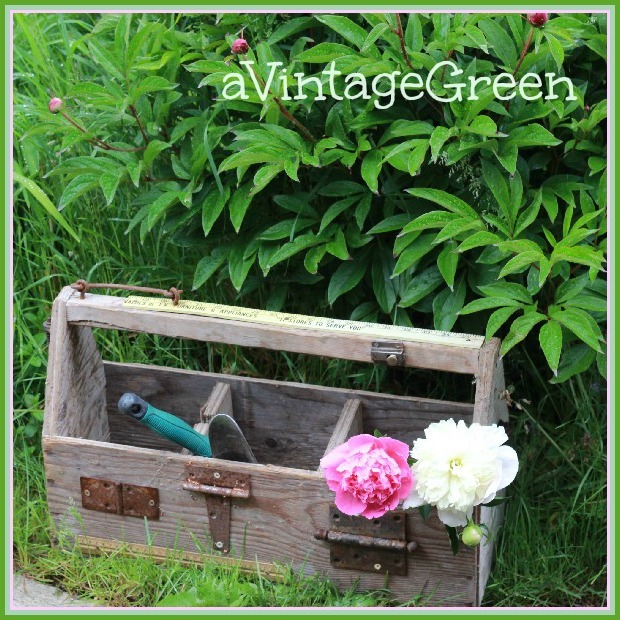 I once wrote a blog post titled ~ "I Never Met A Toolbox I Didn't Like". You did a great job embellishing yours!! This is a great looking tool box! Love your inspiration and how you made your own!! That is really cute. Thank you for joining Home Sweet Home. There IS a reason I saved all those rusty pieces of hardware! Thank-you, for a great example. What a fun tool box. There is always a good use for junk. Thanks sharing at Throwback Thursday. 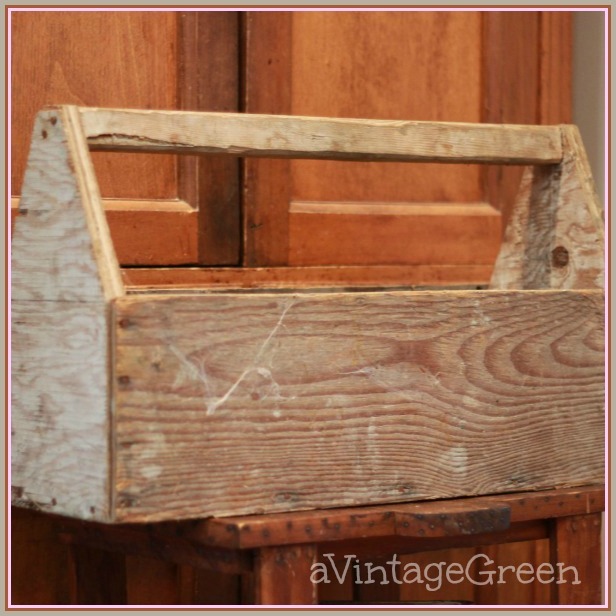 I am dreaming of going through all my junk to make a tool caddy special like you did as inspired by Funky Junk Donna. Yours has a winning personality.